Spend the 12th (Wed) among aquatic life with a scuba or snorkeling tour. Spend the 14th (Fri) spotting exotic species with a safari tour. Next up on the itinerary: look for all kinds of wild species at Hartley's Crocodile Adventures, stroll through Wildlife Habitat Port Douglas, and make a trip to St Mary’s by The Sea chapel. To see more things to do, ratings, traveler tips, and other tourist information, refer to the Port Douglas trip builder site . Berlin, Germany to Port Douglas is an approximately 30-hour combination of flight and shuttle. You can also do a combination of train, flight, and shuttle; or do a combination of flight, car, and ferry. Traveling from Berlin to Port Douglas, you'll lose 9 hours due to the time zone difference. In June, plan for daily highs up to 30°C, and evening lows to 21°C. Wrap up your sightseeing on the 14th (Fri) to allow time to travel to Airlie Beach. Start off your visit on the 15th (Sat): get some thrills on the water with a speed boat tour. On your second day here, take a tour by water with Boat Tours & Water Sports. To see where to stay, other places to visit, more things to do, and other tourist information, refer to the Airlie Beach trip planner . Getting from Port Douglas to Airlie Beach by combination of shuttle, flight, and ferry takes about 6 hours. Other options: do a combination of shuttle, flight, and bus; or drive. When traveling from Port Douglas in June, plan for little chillier days and about the same nights in Airlie Beach: temperatures range from 26°C by day to 21°C at night. 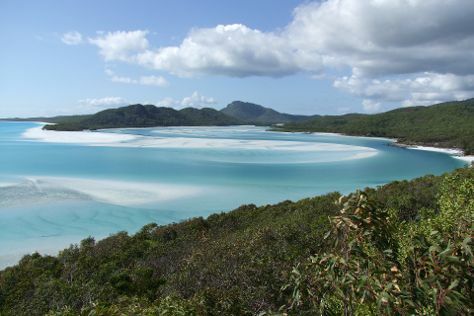 Wrap up your sightseeing on the 16th (Sun) early enough to take a bus to Whitsunday Island. Kick off your visit on the 17th (Mon): explore the activities along Hill Inlet and then kick back and relax at Whitehaven Beach. To see where to stay, reviews, photos, and tourist information, refer to the Whitsunday Island travel itinerary planner. You can take a bus from Airlie Beach to Whitsunday Island in an hour. Another option is to ride a ferry. Plan for a bit cooler nights when traveling from Airlie Beach in June since evenings lows in Whitsunday Island dip to 15°C. Wrap up your sightseeing on the 17th (Mon) early enough to travel to Cairns. Explore Cairns' surroundings by going to Palm Cove (Palm Cove Beach, Annie's Ladies Boutique, & more). Spend the 18th (Tue) among aquatic life with a scuba or snorkeling tour. Spend the 20th (Thu) wandering through the wild on a nature and wildlife tour. And it doesn't end there: trek along Esplanade Boardwalk, enjoy some diversion at Esplanade Lagoon Pool, take in nature's colorful creations at Botanical Gardens, and let little ones run wild at Muddy's Playground. To see photos, traveler tips, reviews, and more tourist information, use the Cairns trip planner . Traveling by flight from Whitsunday Island to Cairns takes 3 hours. Alternatively, you can take a train; or take a bus. Plan for somewhat warmer nights when traveling from Whitsunday Island in June since evenings lows in Cairns dip to 22°C. Wrap up your sightseeing on the 21st (Fri) to allow time to travel back home.